In samādhi the mind becomes still. It is a state of being totally aware of the present moment. It is a one-pointedness of mind in which the seer is also seen. At 16 years old I experienced 24 hours as a single moment while sitting on a solitary island in the Canadian Shield. I had been dropped off on a sandstone/granite island in Amisk Lake in northern Saskatchewan. Quartz and other natural crystals were everywhere. The Adventure Leadership Expedition, by St. John Bosco Camp, was coming to a close. A month of hiking forests, canoeing rivers, surviving in nature, portaging, and hiking once again, had culminated with the dreaded ‘solo’ challenge. We were expected to survive for 24 hours alone on an island. By the time I hit my island, I was physically spent. Long scented with camp fire smoke, human salt sweat, sun and bush; insects didn’t bother with me anymore. Confident I could manage this solo, I happily waved the team leaders off and dropped my dry food, plastic sheet and rope for a ‘hoochie tent’. I sat solidly near the islands edge. Alone at last, I breathed deeply, then listened to the place. Wolves howled on the mainland. The sun begin to angle down the sky. I noticed a rock, deep in the bright water. I stared at it, amazed by it’s beauty in the clear purity of the water. I enjoyed my eye not wanting me to perceive the rock as deep as it really was in the lake. For some reason, in my mind, I began to hear my own name . Beata….Beata….. Beata…it just kept repeating. I joined in. Repeating my own name as a mantra, however at 16 I had little awareness of a mantra. As I was so tired and physically spent, I was content to continue my observation of the rocks under the water. It was easy to repeat my name and so I continued. I watched myself enjoying it. Soon I began to feel differently about my name. I became somewhat dissociated from it. It seemed to lose meaning. Then I could not attach meaning to it at all. It became a mere sound. A sound I was riding on. Unfamiliar so new now, I had no desire to attach any meaning to the sound. I was aware of this moment. A canoe was rounding the point, the sun back lighting the paddlers. I felt confused about the time. It seemed they had just left me. I stood up, waved and yelled, “What are you doing back here ?” They replied, “We’ve come to pick you up silly!”. Once they pulled up and saw me tossing my food and gear into the canoe they asked why I didn’t make camp. I said I didn’t know. I just,’sat here the whole time’. I didn’t feel I needed to make camp. They just laughed at me as we pushed off into the big lake. I never spoke of it again. I largely forgot about it. (Sanskrit: समाधि, Hindi pronunciation: [səˈmaːd̪ʱi]), also called samāpatti, in Hinduism, Buddhism, Jainism, Sikhism and yogic schools, refers to a state of meditative consciousness. It is a meditative absorption or trance, attained by the practice of dhyāna. Can one achieve a Buddhist dhyana, ‘meditative experience’ at a Catholic Kids Camp ? 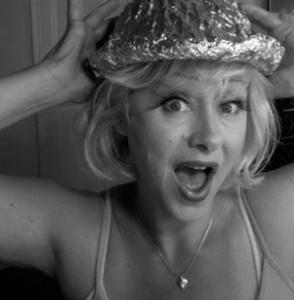 Leave it to Tinfoil Hat Lady. Why did this experience of repeating my own name cause me to lose 24 hours? Was I abducted by aliens ? Maybe….Or…Did I inadvertently create the perfect meditation state through my physical exhaustion, connection with Nature and sheer happiness? A bit of both perhaps ? I forgot about it until years later at a lecture on yoga. The speaker, Lis Pas, spoke of a state of consciousness called Samadhi. When the 5 Hindrances were repressed one could attain this state, which is experienced as a moment. So I looked up these hindrances and lo and behold they seem to apply to my state of consciousness at camp. (kāmacchanda): the particular type of wanting that seeks for happiness through the five senses of sight, sound, smell, taste and physical feeling. CHECK – No need for any sensory desire. At this point I was fully sated from being alive and traveling confidently in the bush for weeks. (vyāpāda; also spelled byāpāda): all kinds of thought related to wanting to reject, feelings of hostility, resentment, hatred and bitterness. CHECK – John Bosco Camp is the most positive spirited camp for youth around. I was high on camp love and forest fever. I was full of gratitude and appreciation for God’s bounty. (thīna-middha): heaviness of body and dullness of mind which drag one down into disabling inertia and thick depression. CHECK – Total physical traveling to the max. Hiking and canoeing. No sloths need apply. (uddhacca-kukkucca): the inability to calm the mind. CHECK – No worries. Feeling very safe and appreciative of being on my own time. No clocks. I felt totally protected on this island. (vicikicchā): lack of conviction or trust. CHECK- I trusted this program, the instructors, the land, the process 100% No doubt. So as I see it, my 5 Hindrances were easily repressed. As a young person the weight and worry of life was not yet born in me. As an adult I wonder if I could re create the experience. Looking back at that time it is wonderful to understand that consciousness and it’s vast divine connection is always available. No special training is needed. It’s quite simple in fact if we dare allow repression of our hindrances.